I was pretty keen to get out of brick laying… something I’d been doing since leaving school at an early age. I’d had a tough childhood full of illness, which didn’t help my chances with education, so my options were pretty limited outside brick laying and plastering. The thought of running a corner diary didn’t really appeal so while I was off work after cutting the tendon to my big toe with a skill saw I started to look at the options. Shotover Jet came up for tender in the paper. It had been running for five years at this point, firstly by the Melhop brothers to make money for their Christian Youth Camp and latterly by Herm Palmer who had been working for them before he bought the operation himself. The tender process stated best offer over $10,000 so I tendered $11,110 and became the rightful owner of a jet boat operation in Queenstown. At this point I’d never driven any boat of any kind in my life, let alone a jet boat! The year was 1970 and while it doesn’t seem a lot of money today, back then I was definitely better off financially brick laying than running Shotover Jet. So I needed to improve things if this was to work long term. To add more complexity to this equation Heather and I had to move from Invercargill, although we both loved the prospect of living in Queenstown. Our eldest Peter started school within a month of arriving and Jillian was just 21 months old… so it was certainly a big deal. Any concerns I had about putting on weight with no more manual labour went out the door… the worry certainly made up for it. For the next five years I drove seven days a week. Geared for 25 trips a day my biggest period saw 146 trips in six straight days. 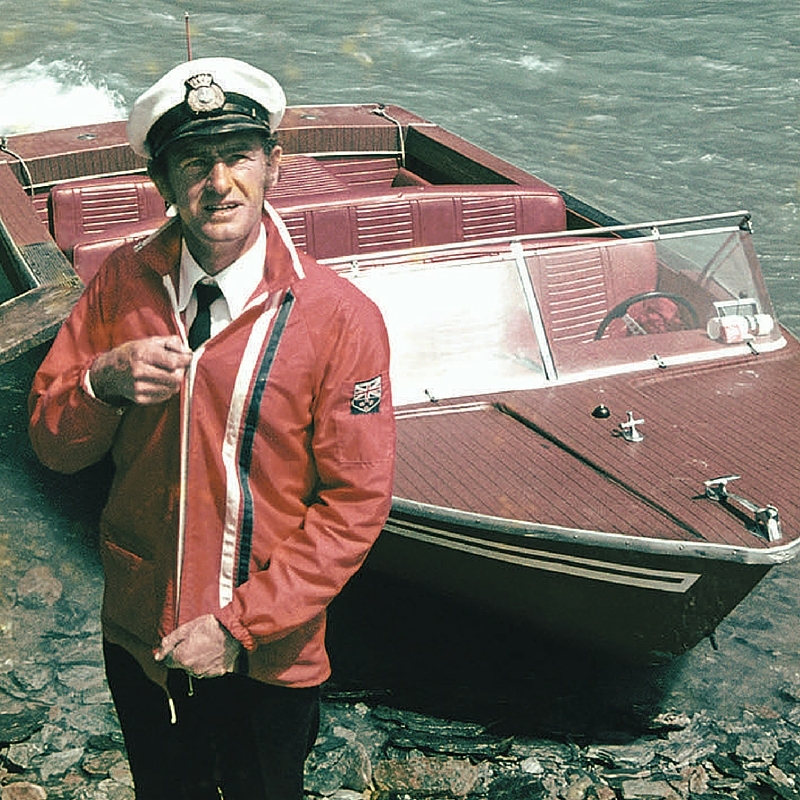 It wasn’t a year round business in those days and winter was time to re-make the brochure, tidy things up and fix everything up including the jet boat. The boat was a Jet 41 with two rows of seats and a shortened bow. A 170 Pursuit Falcon engine powered a Hamilton Colorado single stage jet. After a couple of seasons I was getting my head around what I could and couldn’t do with the jet boat and was able to read the passengers well enough to know just how close I could go to the rock faces. On one occasion a couple in their fifties complained to the van driver on the way back to town that ‘he went too close to the rocks’ and ‘it was alright for those young ones in the front’, so I was naturally more careful when a day or so later a lady in her seventies, complete with hearing aid, was helped into the boat. I went about a more conservative trip missing everything by three or four feet and was about to begin my spiel after bringing the jet boat to careful stop when she jumped in first. Seems she’d been on a much more exciting ride with me last year and she’d brought her husband back based on that expectation. She was outraged at how boring this ride was so I promptly upgraded the rest of the trip to my usual standard just to stop her moaning! That night Heather and I talked about it and decided from that day on we would advertise Shotover Jet as a thrill ride. The Jet 41 had been replaced about a year later with a boat built by Alan Thompson in Rakaia. Still with a wooden deck but the fibreglass hull was replaced with aluminium for greater strength. The boat was designed by marine architect Joseph Van Giel Powered by a Falcon 250 and a two stage Hamilton unit this boat could hold 7 people in two rows of seats. Pretty soon we repowered it with a Holden 308 and three stage for better performance. At this point we also fitted two small seats either side of the engine hatch but they were always sitting very low and it was difficult for them to see. I used to tell them to sit up on the engine cover and they then had the best view of all and that started me thinking about a new design. It was a pretty natural transition from there to tiered seating so we got Bill Irwin at MacIntyre Engineering in Cromwell to build a special boat. It had to be under 16 ft to stay outside the strict marine regulations so this boat was 16ft long and 8ft wide. Hamilton’s actually didn’t think it would float. Van Geil again designed the hull and Hamilton’s put me on to Kelvin Shacklock to design the deck that included seating over the top of the engine providing tiered seating for better views. George Davison from Hamiltons suggested three changes to the hull that Van Giel duly included and somehow Bill Irwin managed to make a practical boat that worked very well. I wanted low compression truck engines that would last longer so we bought three Oldsmobile 455 engines that Hamilton’s had. Ironically they turned out to be the highest performance engine Oldsmobile built but regardless we used those engines for many years. The jet unit was the larger 1031 single stage to handle the increased horsepower and weight. We also increased the passenger numbers to 11, still within the legal limit allowed for a commercial passenger boat running petrol engines. Big Red as she became known was soon joined by a second boat and then a third, although we could legally only run two at a time. Along with that came extra drivers. We employed three and I was able to step back from the day to day work in the driver’s seat. Over the next ten years we employed only eight drivers and the operation became very popular with word spreading far and wide. After a decade we decided it was time to move on and I had been dabbling back in the property and building market around Queenstown. The opportunity came to sell the operation so we took it. At this point we had ten employees, three jet boat drivers, three van drivers, two office staff and two mechanics. It was 1987 and we all know what happened with the share market. The next few years were pretty tough but Heather and I got through it and we continued to do some of the new things we’d wanted to, albeit with a bit of belt tightening. Looking back, there were some fantastic moments… some good, some not so good. One that comes to mind was a time when I had paused to chat to the passengers when I noticed the amp meter was on full discharge. I turned the isolation switch off and assured everyone we were in aluminium boat and all would be fine. We drifted downstream and onto some rocks so I unwound the anchor rope and jumped off but the boat immediately moved off, with the passengers onboard and me running downstream chasing them. I darted through the tunnel at the top of the lower gorge coming out downstream, assuming they’d come floating by but they didn’t arrive. Back on the other side of the tunnel I found the boat and passengers were now wedged against a rock on the other side of the river. Eventually I found a shallow enough section of the river upstream to cross over and get to them. The reverse bucket had been broken when the boat hit the rock so we tied that up, found the loose wire that had caused the electrical short in the first place and returned everyone to the jetty. We refunded all of them for their trouble but I still reckon they had the best thrill ride we ever did! … and what of the modern Shotover Jet? When we took over we were carrying 3000 passengers a year in one jet boat… when we sold the business we were carrying 58, 600 passengers in two boats. Today four Shotover jet boats each carrying 17 passengers carry 140,000 per year in four boats. It’s the third most popular attraction in Queenstown behind the Earnslaw and the Gondola. It’s being run very well and that’s something I’m very pleased to see. Heather and I certainly have no regrets. From this conversation it is obvious Trevor Gamble is immensely proud of the contribution he and Heather have made to Shotover Jet and the wider Queenstown community. True to his humble nature though none of his VIP clients he has transported around the Lakes District for Limousines Services over the past two decades would be any the wiser to the hugely significant contribution their driver has made to tourism. At the recent 50th celebrations for Shotover Jet Marketing Manager Nigel Kerr made this observation.